There was a long line of cars waiting on February 12 at 10:00AM to go through the entrance to El Dorado Park and the P. D. Pitchford Companion Animal Village. This isn’t unusual because Saturdays tend to slam up at the guard house as guests pay the entrance fee to the park. This time, however, everyone was on their way to Long Beach Animal Care Services’ (ACS) Open House and no one had to pay an entrance fee, so that should have sped things up. ACS’s Open House included a volunteer-awards presentation; progress made by shelter staff, including live-release and euthanasia statistics; and highlights of 2017 and the shelter’s vision for 2018. 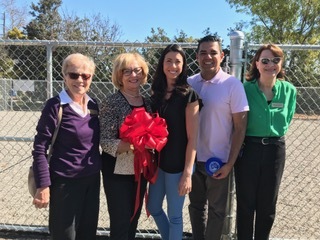 The ribbon cutting for the new Dog Play Yard followed the event. The attendance numbers might have been related to the Yard; more likely, it was attributable to the presence of the animal-advocacy community, which has become more vocal and organized this year. Highlights of 2017 included a three-year high-tech study of coyote behavior about to finish its first year; 170 adoptions and counting at the Cat Adoption Center, sponsored by community partner Pet Food express; the videotaping by ShelterMe of this year’s Kitty Hall for a PBS documentary—20 cats went home this year from this even sponsored by Mayor Robert Garcia; the new Adoption Waggin’s presence at various city events such as summer movie nights; and transports of pets to ASPCA-approved shelters around the country where there’s actually a shortage. This year, the Cat Cottages and outdoor “catio” will receive a major refurbishment, with air conditioning, energy-efficient windows and new flooring. Shelter felines will have a clean new place to shed stress and fur and to show themselves off to potential adopters. 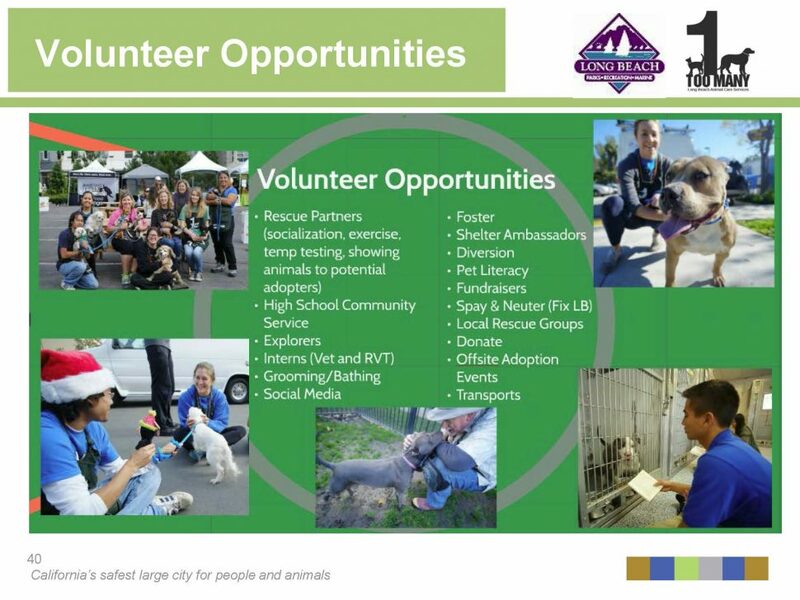 The staff will also be hiring a full-time veterinary technician and a new marketing director, which will be changed to a full-time position. Shelter volunteers and benefactors were recognized for service over and above the usual. 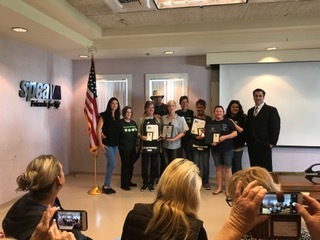 Award certificates, provided by Long Beach Mayor Robert Garcia’s office, were presented for daily attendance, devotion to dogs or cats, being “matchmakers,” transporting animals, walking and bottle feeding, training, and sitting with a sick, suffering animal when it passes from life. “Volunteers show up open-hearted, giving one of the greatest gifts they can give in their lives—their time,” said Adoption Coordinator Jill Prout, who presented the awards. From left, front: Fifth District Councilmember Stacy Mungo (One Too Many Award, accepting for FOLBA), Diane Tankard (Helping Hand honoree), Wendy Steelhammer (half of Dynamic Duo honoree), Julie Somers (Spirit of Dr. Loren Eslinger Volunteer of the Year honoree), Colleen Shackley (Rookie of the Year honoree), Wendy Williams (Cats’ Best Friend honoree), ACS Adoption Coordinator Jill Prout, ACS Manager Ted Stevens. From left, rear: Bill Steelhammer (other half of Dynamic Duo honoree), Mary Agugliaro (Dogs’ Best Friend honoree). The Spirit of Dr. Loren Eslinger Award, named in memory of a Long Beach veterinarian who volunteered her time and skills to the shelter and was dedicated to spay/neuter, was awarded to Julie Somers, who heads the Cat Adoption Center at Pet Food Express (see “Julie of the Wolves” in the February 23 Long Beach Post). The Center is ACS’s satellite adoption center. Cats with issues such as stress or who may be overlooked because of their age or condition can be viewed in a more cat-friendly environment, making them more attractive to potential adopters. Somers said that volunteers are needed at the Center and asked anyone interested to email her at [email protected]. Friends of Long Beach Animals (FOLBA) won the One Too Many Award, given to the volunteer or organization that has helped alleviate the effects of irresponsibility and cruelty regarding animals. FOLBA President Stacy Couch accepted the award for the group. Couch added that stopping euthanasia begins with stopping cats and dogs from having more kittens and puppies than the population can support. ACS actively supports the efforts of FOLBA and Fix Long Beach to fix the pets of Long Beach residents who cannot afford the procedures and, in Fix Long Beach’s instance, provide free microchips. Last year, nearly 2,700 vouchers were given out, making a total of over 17,000 since 1990, Stevens said. This year’s contribution from FOLBA was specialized training from Dogs Playing for Life. This time, the training was for the volunteers and not the dogs, and it is now implemented in the brand-new Dog Play Yard. The Play Yard was constructed with funds provided by Kay Reed and has been named Reed’s Corner in memory of Kay’s husband, Harold Reed. 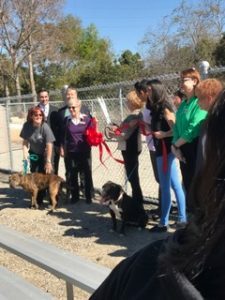 A ribbon-cutting ceremony took place after the Open House, and the public was able to get a one-time glance at the dogs enjoying the yard and the training in action—the space isn’t open to the public. OK, Boy! Go play! Kay Reed cut the ribbon at the ceremony for the new Dog Play Yard, for which she donated funds. Photo on right, from left, FOLBA Vice President Nona Daly, Reed, Fifth District Councilmember Stacy Mungo, Long Beach Mayor Robert Garcia and FOLBA President Stacy Couch. Photos by Kate Karp. 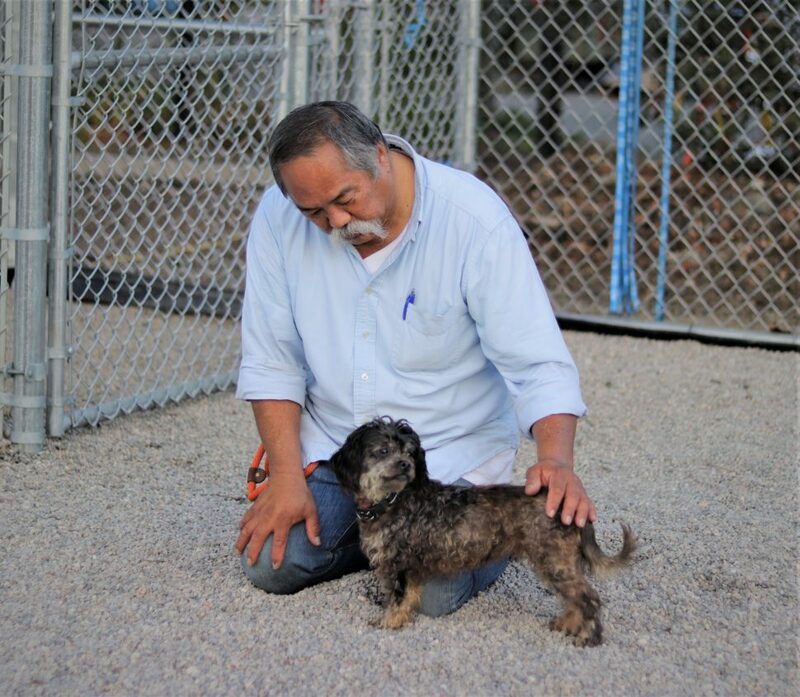 Ubervolunteer Gary has a quiet moment with Mona in the new Dog Play Yard. Photo courtesy of Dogs Playing for Life. The gravel floor in the Play Yard was provided by the Conservation Corps, an ACS Strategic Partner. The Conservation Corps recently formed a shelter internship program that provides job training and work experience as kennel attendants. Shelter partners, courtesy of ACS. Other shelter partnerships include the Community Cat Shelter/Neuter/Return (SNR) Program, which facilitates trapping, spaying or neutering, and releasing cats back to their stomping grounds. Kittens born of the parents are adopted out or, when possible, given to bottle feeders. The program has resulted in reduced intake and fewer neighborhood complaints. 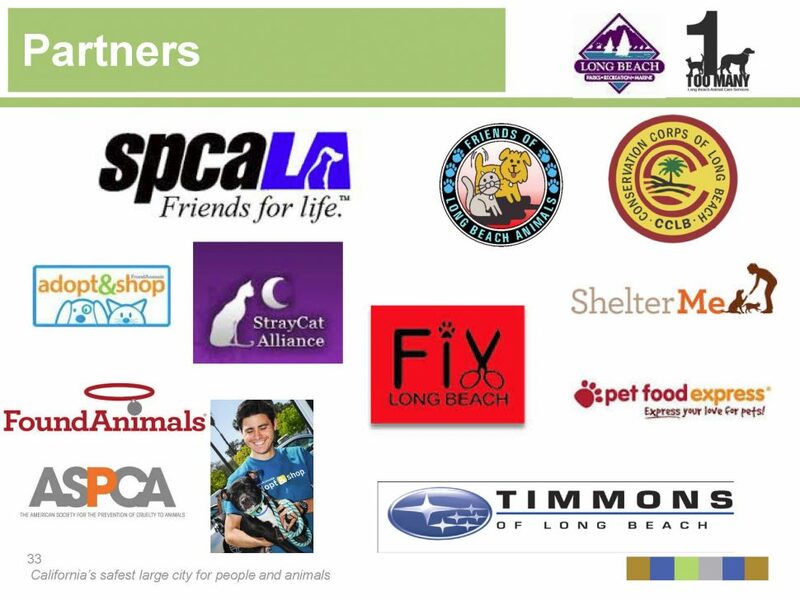 The biggest partner, Stevens said, is spcaLA, which holds the lease to the P. D. Pitchford Companion Animal Village. ACS shares the venue with the private rescue spcaLA—this is often a cause for confusion for Village visitors looking for either entity. Stevens also went over the duties of the Veterinary Medical Team, the Rehoming Team, the Animal Care Team and the other departments. Stevens reviewed the responsibilities of Field Services, which includes the Special Investigations Unit, breeding enforcement, citation appeals and barking complaints, and dealing with everything from stray animals to untangling an owl hanging by its talon in a fishing line under a bridge. The animal-control officers (ACOs) are sporting new casual uniforms. ACOs in their new casual uniforms. “We wanted to make them more comfortable and not look like ‘county sheriffs,’” Stevens said. Photo courtesy of ACS. ACS is closed to the public on Mondays and Tuesdays, but there’s still an officer on duty 24 hours. Stevens said that the shelter has always been designed to be animal control, and branching out to rescue and adoption in the past few years has led to a need to shift and stretch resources. Now, ACS is facing the challenge of an intensive audit requested by Mayor Garcia. The audit is conducted by the City Auditor’s Office in tandem with JVR, a team of shelter experts that specializes in consultations and reviews of open shelters nationwide. Phase 1, completed in December 2017, lays out how much ACS has stretched its resources to the snapping point in an effort to go beyond animal control. Findings have elicited much discourse and debate from the animal-advocacy community, who are not always in mutual agreement but who are steadfast in a resolve to effect change (entire text of Phase I of the audit can be accessed here). JVR members praised ACS and its staff for its dedication to saving lives. However, they also stressed that best outcomes for pets may be hampered by the shelter extending itself beyond its resources and limitations to implement programs and provide service. Standard operating procedures will also need definition. “The audit was very important,” Garcia said. “The numbers are absolutely going in the right direction—my commitment is that every year we should improve.” Garcia was referring to the 2017 statistics (see “Shelter Statistics for 2017 Show a Continuing Upward Trend”), which since 2012 have shown a continuous decline in euthanasia numbers and impounds and growth in live release of pets. Stevens said that he was more than happy to receive praise for his staff and also that the shelter is performing above average with respect to other public shelters in the country. Stevens said that the team recognized how limited the shelter’s resources are and that the staff does “a little too much.” The staff is stretched beyond its abilities; the second part of the audit will address staffing levels. Stevens also thanked the attendees who regularly volunteer and appealed to the ones who haven’t yet. Several volunteer opportunities are available at ACS. To volunteer, visit this page. 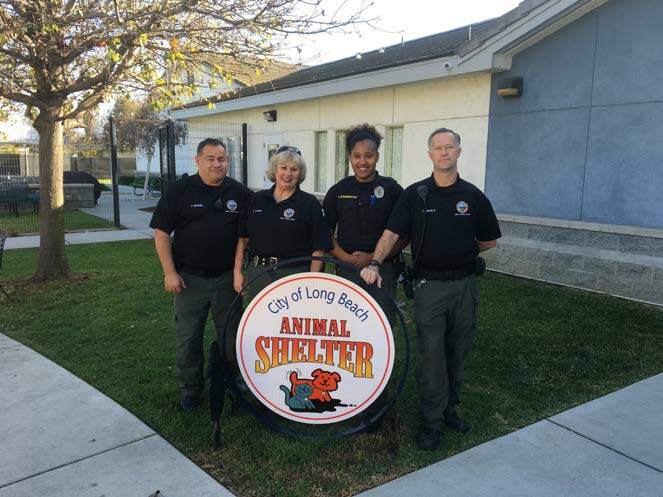 Long Beach Animal Care Services is located at 7700 East Spring Street at the entrance to El Dorado Park (no charge to Village visitors) in the P. D. Pitchford Companion Animal Village. Call (562) 570-PETS for information.